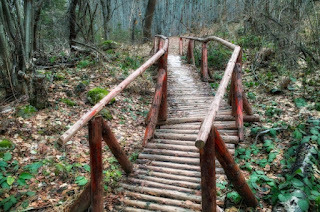 Howdy, Campers--and Happy Poetry Friday (original poem and PF link below)! 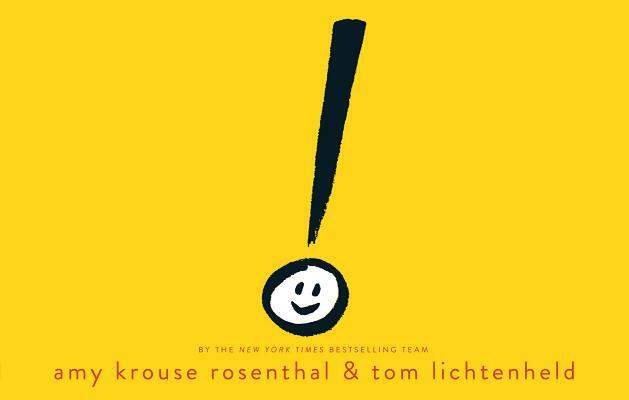 This is the last of our series about punctuation and related topics. Bobbi started us off with For the Love of Comma (her post was mentioned in Quercus), Esther offers A New Mark of Punctuation (sort of)...,Carla illustrates her point with specific examples from her books in How You Tell the Story Makes a Difference, and Mary Ann pleads, Can We Give the Exclamation Point a Rest? 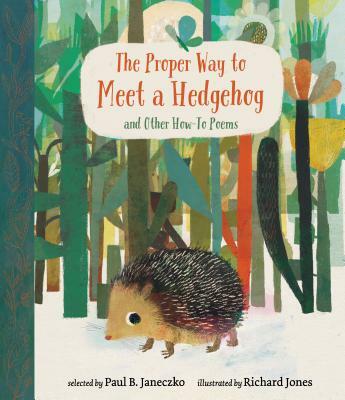 When my son was four, he was lying on the floor leisurely looking at a book one morning when I rushed in. "C'mon, honey--we've gotta go!" "Okay, Mommy," he said marking his page, "lemme put it on pause." 1) A few years ago, I bought my mom (a true Punctuation Queen) this plaque. 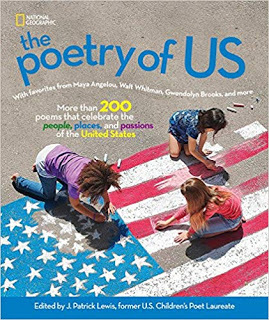 2) When my son was in elementary school, I read poetry to his class once a week. I was trying to be like my teacher, Myra Cohn Livingston: I wanted to share poetry with no strings attached. As I read, they listened, just listened. Nothing was expected of them. I read every poem twice. 3) We're told so much about the health benefits of deep breathing; of taking time to slow down. Remember to Breathe, they say. And just think: as writers, with our very own fingers, we have magic power. Add a comma, push the pause button. Em M, who won JoAnn Early Macken's Baby Says Moo wonderful board book--lucky Em! 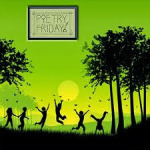 Poetry Friday is at Carol's Corner this week--thanks for hosting, Carol! As I said, TeachingAuthors is taking our annual Summer Blogging Break after this post (our sixth annual blogging break, for those of you who are paying attention). We'll be back in two shakes of a lamb's tail--which technically is Monday, July 13th. So, grab your towel, dive into the pool, and swim a few laps while we're gone ~ TTFN! 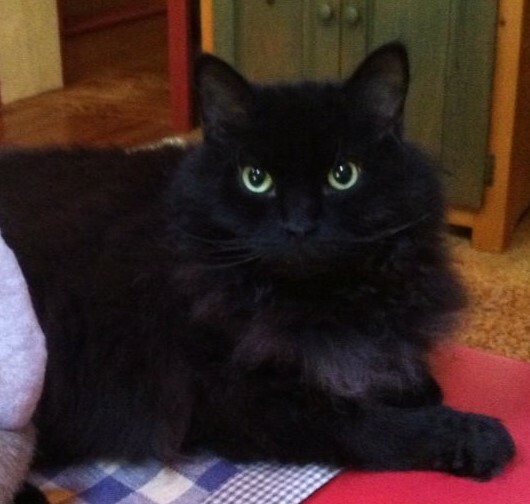 posted on a summer's day by April Halprin Wayland--with help from Eli (dog), Snot (cat), and Monkey. Young Author's Camps are well under way. It's Sunday night, and I am anticipating tomorrow's new group of writers. To (sort of) quote Forrest Gump, "Writing campers are like a box of chocolates. You never know what you are going to get." If this camp is true to form, it will be a Whitman's Sampler of writers. Kids whose parents think I am running a remedial writing boot camp despite the Parks' Department naming the program "Writing is Fun!" (Remember that exclamation point.) Learning disabled kids. Kids who are there because their parents need a place to park them for the week...and mine was the only camp that still had openings. (Always flattering to hear, "You're all that was left.") And of course, there are usually some kids who there because they love to write. Usually. Not always. For the last several years, every session has had a core of writers for whom English is a second language. No one can put together a perfect English sentence the way a 10-year-old who learned the language in school can. Their subjects and verbs agree, something that seems "optional" to a number of "English only" kids. Tenses don't leap from past to present to future in the same sentence. Punctuation is meticulous. Speaking of punctuation, these ESOL kids have learned the Power of the Punctuation Point. A lot of kids let the exclamation point do all the heavy lifting in a sentence. Rather than show the reader fear, joy, surprise (fill in the emotion here), they toss big handfuls of exclamation points instead. A paragraph of five sentences will include six exclamation points. (More is better, right?) After awhile those little points seem to rise off the page in platoons, stabbing at my eyeballs. A slight exaggeration, but after awhile all you see on the page is !!!!!!!!!!!!! Example: I was so sad when we moved! I left all my friends behind! I didn't know anybody at school! I hated school! I was always in a bad mood! Even my dog was in a bad mood!!!! Why are these kids so dependent on the point? My first thought is to blame texting and email which has shrunk language down to emoticons and acronyms (OMG, LOL, 😄). But most of my students are not allowed on social media, or have email accounts. Back in the day, teachers blamed comic books for sloppy punctuation (Pow! Biff! Bam! Take that, Batman!). I haven't run across any of comic fans among my writers. Video games like World of Warcraft or Call of Duty, yes. Comic books, no. There are a handful of chapter book writers who go over the top with the punctuation points for comic effect. I'm not laughing, but the kids are. Still, even those writers do it a couple of times per book at most, not every sentence. It comes back to something I've posted about before...vocabulary. For my young writers, it is easier to use my two pet peeves, the word "very" combined with an adjective and an exclamation point. In revision of their work, I encourage them to find another way of expressing the emotion without using "very." Example: The test was very hard! hard? Did your head ache? Did you write so much your hand hurt? Or was it hard to understand? Were the directions unclear? Did you mix-up your facts? Or were the questions more difficult than you expected? Or did it just make you think harder? "Hard" can mean a lot of things in describing a test. What exactly did you mean? At this point I bring out my trusty thesaurus collection: beginners, intermediate and Roget's. My students are familiar with the thesaurus...the one on their word processing program. I compare the meager selection offered by the computer program to the many, many options in the thesaurus. They learn they cannot slide by with what I call "wimp words"...words too general to say what they mean. The substitutions for wimp words are in the thesaurus. By the end of the week, they have almost eliminated phrases such as very beautiful, very hot, very boring. Instead, flowers are exquisite, days swelter and TV shows uninteresting. Once the "enabler" word "very" disappears, the punctuation marks often disappear as well. At least they do in descriptive passages. They still seem to show up in dialog. How else do you show some one is excited? Example: "It's raining!" she said excitedly. In this case, the culprit is "said." Said is a perfectly good word. It's meant to be unobtrusive in dialog. Sometimes, however, you want to know how that sentence is...well...said. How could you show the speaker is excited without that pesky exclamation point? Swap said for one of the following verbs: screamed, shouted, yelled, exclaimed, moaned, groaned, cried, wailed, howled, wailed, gasped, choked,shrieked, rejoiced, squealed, cheered, announced. If after all those choices the writer still can't let go of that exclamation point, I issue an ultimatum. Two exclamation points for the whole piece. More than two, I tell the student, "Imagine that I control the world supply of exclamation points. If you wan to use on, they are now a hundred dollars apiece." The silliness of the notion usually makes the writer think twice about using them. Again, in the words of Forrest Gump..."And that's all I have to say about that." 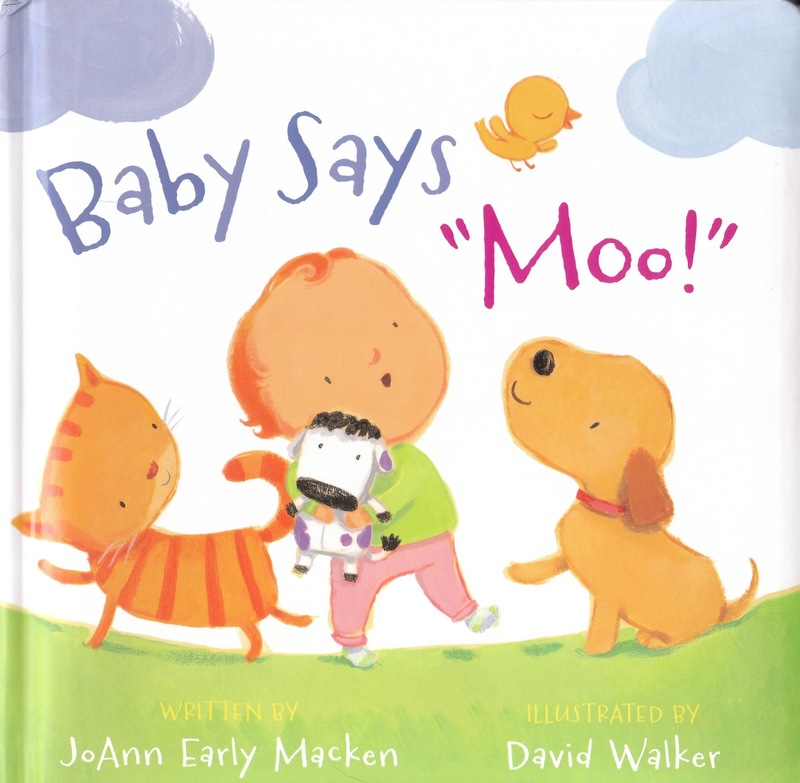 Today is the last time to register for our give away of JoAnn Early Macken's board book, BABY SAYS MOO. For details, see JoAnn's June 12 post. 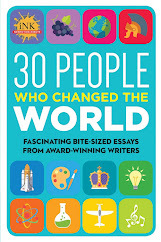 As I write nonfiction books, I carefully consider sentence length and punctuation. Every sentence is crafted in a way that will support the pacing of my (true) story. Does sentence structure and punctuation affect the pacing of the story? Absolutely! How you write the text makes all the difference. I could have begun this book in countless ways. I chose to begin the book with a young man named Von Gammon because I believe it sets the scene for the whole book. I wanted to pull the reader in by giving them a glimpse into Von’s life. 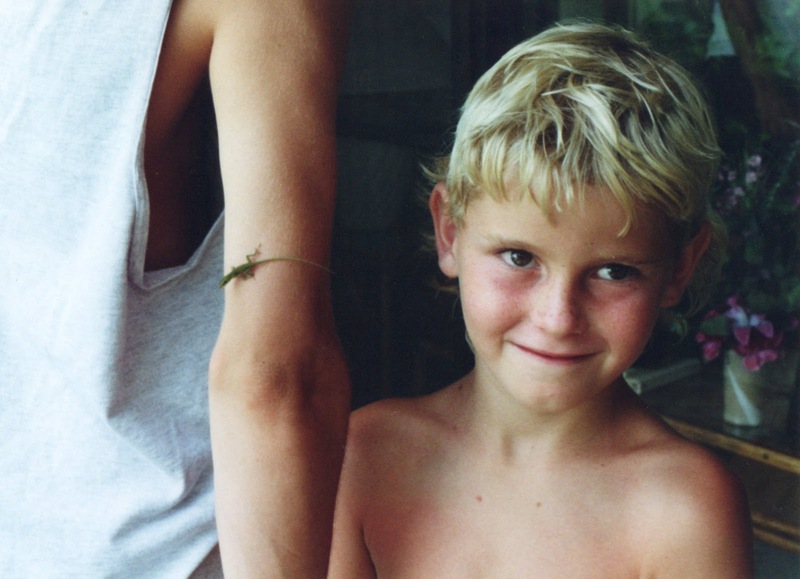 Once I decided to open the book with this young man, there were countless ways I could have written the scene. Von Gammon lay down on the grass. He told his brother to stand on his hands. Von was strong and could prove it. He could lift his brother who was six feet six inches tall off the ground. Von was strong and skilled. Von Gammon lay down on the grass and told his brother to stand on his hands. Von was strong, and he could prove it. Then he lifted his brother—all six feet and six inches of him—clear off the ground. And Von wasn’t just strong; he was skilled. The second example is what appears in the published book. The first example communicates the same information, but doesn’t pull the reader into the story. The difference is in the sentence structure and punctuation. Just a few sentences later, I write about the moment things changed for Von. Which of the following is more interesting? 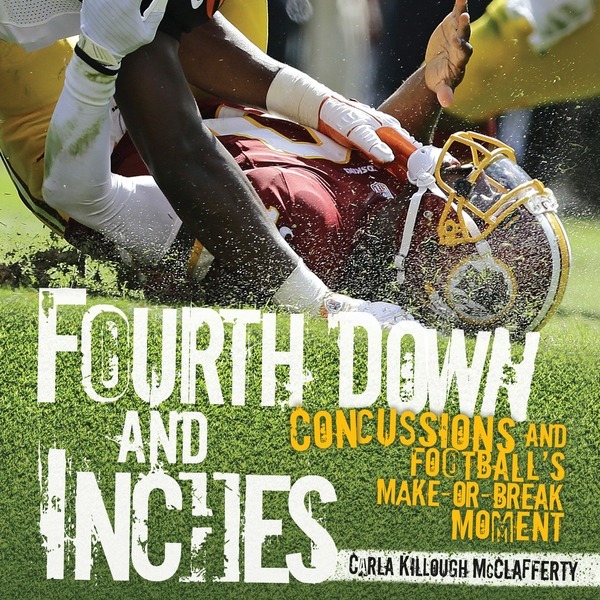 When Von was a sophomore, he played in a football game that took place on October 30. He was on the University of George team and they were playing the University of Virginia. Von’s team was behind by seven points. The other team had control of the ball. Von was a defensive lineman. When the ball was snapped and the play began, the linemen hit each other. Von laid on the field after all the other players walked away. On October 30 of Von’s sophomore year, the Georgia Bulldogs were battling the University of Virginia. They trailed by seven points, and Virginia had the ball. Von took his place on the defensive line. The center snapped the ball. A mass of offensive linemen lurched toward Von, and he met them with equal force. The play ended in a stack of tangled bodies. One by one, the Virginia players got up and walked away. Von didn’t. The second example appears in the published book. Again it isn’t the information that is different; it is how the information is presented that is different. Because Von sustained a concussion and died a few hours later. His death caused many to wonder if football was too dangerous. 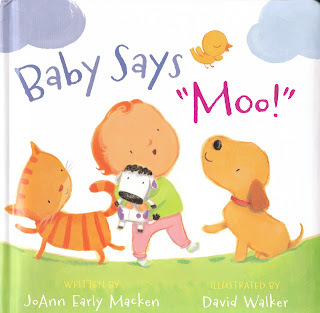 Win an autographed copy Baby Says “Moo!” by JoAnn Early Macken. 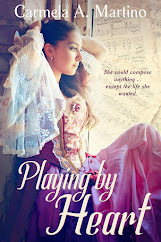 For more details on the book and enter the book giveaway, see her blog entry on June 12, 2015. The giveaway runs through June 22. The winner will be announced on June 26. As a writing teacher, and a working writer, I found the greatest challenge is learning the fine art of punctuation. The secret, I discovered, is writing for the reader's eye. Understanding how the reader approaches text offers you key insight into how to write with clarity and grace. Readers approach the text by moving left to right. Readers interpret information by this forward projection. Readers expect subject-verb-object structures in sentences. They tend to focus on the verb that resolves the sentence's syntax, and in so doing, tend to resist information until after the verb is identified. This is why concrete subjects and action-oriented verbs carry the weight of the sentence. If the subject is vague or nonexistent, or the verb is passive, the sentence often falls apart. Because readers project forward, they intuitively search for the subject, skimming over qualifying clauses or phrases that precede the subject. This becomes important in longer sentences, when the subject does not debut until mid-way or beyond. This is why subjects placed as close to the opening of the sentence as possible make for stronger sentences. Active voice maintains this forward process. It originates with the grammatical subject, flows through the verb, and results in an outcome. Some research suggests that readers understand and remember information more readily when structure corresponds to this cause-effect sequence. Passive structure forces this action in reverse: a subject is either implied or supplied in a subordinate phrase, and the outcome becomes the grammatical subject. The rhythm of a narrative is found in its punctuation. As sentences crash and fall “like the waves of the sea,” punctuation becomes the music of the language, says Noah Lukeman, in one of my favorite reads, A Dash of Style (2006). 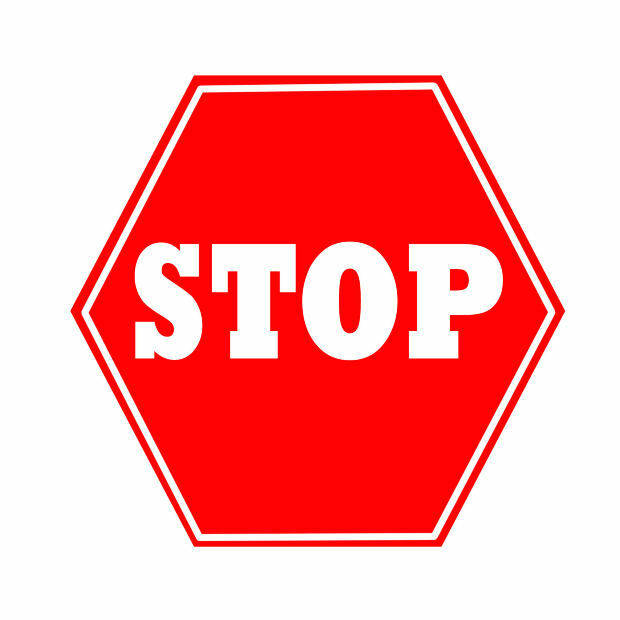 Periods are the stop signs, says Lukeman, and hold the most power in the punctuation universe. All other marks – the comma, the dash, the colon and semi-colon, and so on – serve only to modify what lies between the periods. Sometimes a usurper, like the exclamation point or the question mark, intervenes, but its control is temporary. Imagine a book without periods, or a book that has periods after every word, and you begin to understand its supreme power. A well-placed period, especially in battle with one of its usurpers, helps pacing and adds emphasis. It speeds the narrative up in an action-sequence, heightening the drama. For example, can you hear the drum beat in this passage from my book, Girls of Gettysburg (Holiday House, 2014)? Bayonets glistening in the hot sun, the wall of men stepped off the rise in perfect order. The cannoneers cheered as the soldiers moved through the artillery line, into the open fields. The line had advanced less than two hundred yards when the Federals sent shell after shall howling into their midst. The shells exploded, leaving holes where the earth had been. Shells pummeled the marching men. As one man fell in the front of the line, another stepped up to take his place. Smoke billowed into a curtain of white, thick and heavy as fog, stalking them across the field. Still they marched on. They held their fire, waiting for the order. Boom! A riderless horse, wide-eyed and bloodied, emerged from the cloud of smoke. It screamed in panic as another shell exploded. Boom! All around lay the dead and dying. There seemed more dead than living now. Men fell legless, headless, armless, black with burns and red with blood. Boom! They very earth shook with the terrible hellfire. But, as the cliché reminds us, there can be too much of a good thing (except chocolate, of course). A string of short sentences can become a choppy ride. Like riding in a Model T Ford. Stuck in the wrong gear. Chug! Chug! Chug! Going over a rutted road. It bounces. And bounces. And bounces. My head hurts. Ouch! Ouch! Ouch! Stop. This. Car. And. Let. Me. Out. And no one wants to read a sentence that never ends, one that goes on and on and on and on, in some stream-of-consciousness rambling of fanciful swooping and looping and drooping that serves no purpose other than to satisfy the writer’s ego. If the period is the stop sign, then the comma is the speed bump, says Lukeman. It controls the ebb and flow of the sentence’s rhythm. A comma connects and divides. In fact, as Lukeman warns, it’s downright schizophrenic. 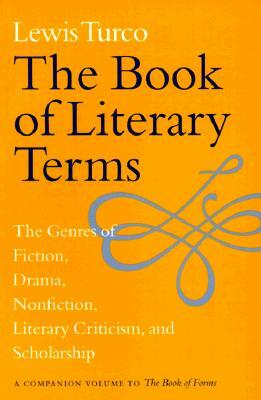 It divides the sentences into parts, clarifying its meaning, or in some cases, changing its meaning. Consider this favorite Facebook meme: A woman, without her man, is nothing. But, with a wave of the magic punctuation wand, it changes to this: A woman: without her, man is nothing. A comma connects smaller ideas to create a more powerful idea: We hold these truths to be self-evident, that all men are created equal, that they are endowed by their Creator with certain unalienable Rights, that among these are Life, Liberty, and the pursuit of Happiness. Everyone has heard the saying, placing a comma is like taking a breath in a sentence. 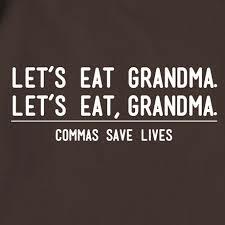 But a sentence with too many commas sends the reader into hyperventilation. And one with not enough commas forces the reader to hold her breath unto she turns blue. So, where do you place your comma? Somewhere between the period and the comma is the semi-colon. This is the mediator, says Lukeman, and “a bridge between the two worlds.” With a style all its own, the semi-colon connects two thematically-related ideas while maintaining the independence of both. It can be used to smooth out the choppy ride found in a string of short sentences, or give a breath of air in a long-winded sentence. However, the semi-colon doesn’t always play well with others. It competes for attention with the comma. Because a semi-colon slows the action down, the effect of a comma and, most especially the period, is minimized. And then there are colons. Colons are just plain bossy. They don't like to share. They especially don’t like semi-colons, despite the similar names. With a flair for the dramatic, colons are the master magicians: they reveal. (<See what I did there?) Colons hold the audience in suspense, says Lukeman. Then, at the right moment, the writer pulls the curtain back to reveal some fundamental truth of the narrative. Remember the Facebook meme example? A woman: without her, man is nothing. But too often misunderstood and underappreciated, the colon tends to be reduced to mundane tasks, like signaling lists and offering summaries. Then, of course, there are the dashes, ellipses, slashes and myriad of other punctuation marks. Alas, I’ve run out of space. In the end, as Noah Lukeman says, punctuation is organic, a complex universe subject to the writer’s purpose and personal tastes. What works in one narrative doesn’t work in every narrative. And for every rule, there is an exception. At its core, however, punctuation is a journey of self-awareness and reveals as much about the writer as it does about the writing. Boyle, Toni and K.D. Sullivan. The Gremlins of Grammar. NY: McGraw-Hill, 2006. Lukeman, Noah. A Dash of Style. NY: WW Norton, 2006. I find inspiration in real life. Rummaging through flea markets and antique stores, examining the jumbled pieces of other peoples' lives sets my story radar pinging. How did these odds and ends come to rest, unwanted by their "families," in a junk store? A story begins simmering in the back of my brain. I am addicted to old family pictures. I gaze at the walls of other people's houses, memorizing family portraits. My mother practically raised me at estate sales and junk stores. I was not allowed to touch anything, but I could ask all the questions I wanted. What was this metal thing used for? Who wore shoes that buttoned up the sides? Did you have a doll like this when you were a little girl? The two people who encouraged my curiosity in the past would be surprised to learn I consider them the fairy godmothers of my writing. 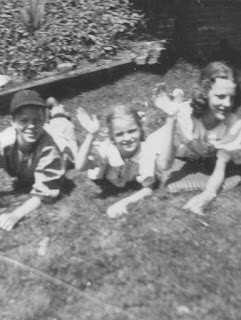 Those two people were my Grandmother Rodman and my mom, both natural born storytellers. 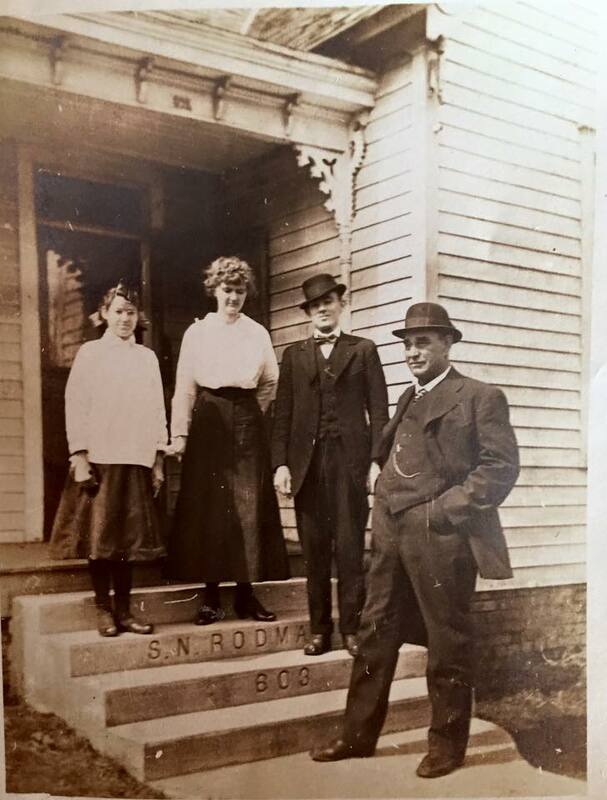 Although her father had been a country schoolmaster, my Grandmother Rodman's education ended at 11. However, she loved to read and never stopped learning through out her very long life (she lived to be 97). 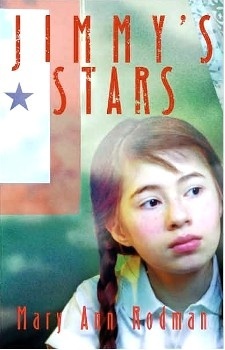 Her childhood was positively Dickensian; orphaned at 11, she lived with an "evil stepfather" and numerous half-siblings. Her older brothers had gone off to "seek their fortunes" and escape their abusive stepfather. Murder, the county poor farm, setting off on her own at 15 to make her way in the world...all these elements were part of my grandmother's story. As a young mother she survived the most deadly tornado in U.S. history. She told "The Storm Story" when few people talked about tragedies. My grandmother made sense of her own life by telling the stories, over and over, always in an undramatic, matter of fact voice. She knew which details would make her story real for a little listener...the taste of homemade peanut brittle, the mustard color of a funnel cloud so enormous it blocked the sky, the stiff, slick material of her mother's "Sunday dress." 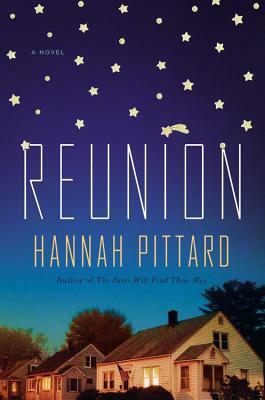 Her stories were peopled with characters named Country and Myrtle and Ardell. She evoked the sound of their voices, the way they stood and moved, the little quirks that made those long-dead people come alive. She was economical with her words, as she brought the events to the climax, never once saying "Oh I forgot to say that..."
Not only could my grandmother put names to the family photos she kept in a big silk stationary box under her bed, she could spin stories about every one of them. She also told me about my father growing up in small-town, Depression-era, Southern Illinois. My father did not tell me his own boyhood until very recently. Learning what kind of little boy he had been, helped me understand my sometimes puzzling, taciturn dad. 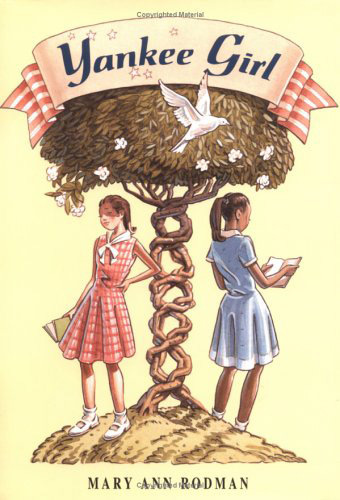 Yankee Girl is based on my own childhood stories I told my daughter. I am currently working on two books that are based on Grandmother Rodman tales. I'm sure that neither my grandmother or mother knew they would inspire my own books. Their stories taught me the beauty and drama of everyday life. This sense of wonder in what seems ordinary to us, I try to pass on to my own students. 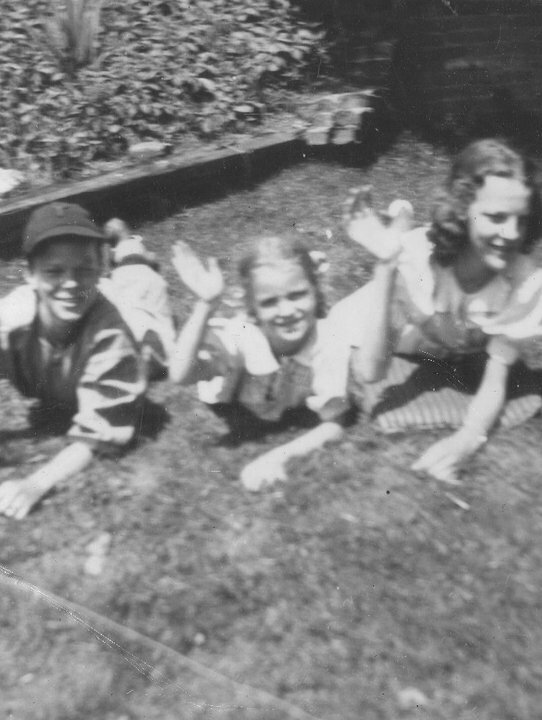 Over the years, they have told me about grandparents who wandered in the rubble of WWII Europe, orphaned and homeless. Of their parents as children, in refugee camps, fleeing Asia by boat. One girl's family escaped the Holocaust by immigrating to Cuba... and then fled Cuba after the Revolution. 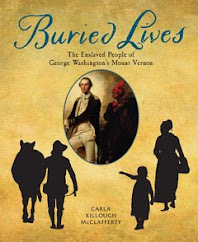 My hope is that these tales will live on in my students' writing. I think the best gift you can give a child is a family story. I was blessed to be descended from two of the best storytellers ever. Thanks, Meemaw. Thanks, Mom.